The below artworks are the most important by Thomas Gainsborough - that both overview the major creative periods, and highlight the greatest achievements by the artist. Artwork description & Analysis: Amidst the abundance of beautiful trees in the peaceful free woodlands, rural folk are seen moving across a serpentine path that activates the deep stillness of the woods. Laid out from the left foreground, this alley introduces the viewer to a woodcutter, a worker on a short break from shoveling who is perhaps, conversing with a seated young lady. Upon moving further a man is seen treading along, with a bundle on his back and at a distance is a man riding a horse towards the church that is faintly visible at the end of the trail. On the right side of this road is a pond that quietly runs through the dense trees and foliage. Gainsborough was perhaps, one of the earliest artists to have conveyed a statement against urban development via a retreat into nature through landscape painting. Having spent his later life in Bath and the city of London, although his desire for the country side never ceased, it seems he hoped for a better quality of rural life when he said, "We must jog on and be content with the jingling of bells, only damn it! I hate the dust! the kicking up of the dust, and being confined in harness to follow the track, while others ride in the wagon, under cover, stretching their legs in the straw at ease, and gazing at green trees and blue skies." An interesting latest development related to this work is the discovery of a study sketch in 2017 that was one of the twenty-six drawings in the Royal Collection at Windsor Castle. These were earlier incorrectly attributed to another artist, Sir Edwin Landseer. This drawing provides an insight into the process of working of the creative mind of the artist in that Gainsborough makes a plan, a perfect blueprint by composing the trees on a grid to help him progress with the final painting based on this schema. Artwork description & Analysis: In the middle of the 18th century, a recently married wealthy couple wanted to commemorate their status by commissioning this art work. On the extreme left is Mr. Robert Andrews, while Mrs. Frances Andrews is seated on a bench. They are dressed in the costumes that reflect contemporary English aristocratic life style. Elements in the surrounding landscape of Auberies, Andrews' estate in Sudbury, convey that the vast land in their control is also used for producing wheat and includes a sheep farm. Facility with modern means of farming it seems has provided Mr. Andrews with enough leisure for other pursuits of interest as he is here shown sporting a typical hunting hat and clasps a rifle under his right arm. An elaborate 'Mantua' gown of light blue in which the lady appears was an outfit to be worn for ceremonies at court. Displaying their opulence, the couple seems to be looking at the spectators as if in a conversation. For, this work can be categorized as a 'conversation piece', a genre of informal group portraits of people in discussion, usually ignorant of the viewer, which was popular in 18th century England. However, this work is unusual and deviates from that tradition in more ways than one, for instance Mr. and Mrs. Andrews are clearly acknowledging the presence of the artist as viewer. Also, Gainsborough aligns the man and wife on to the left to give more space for landscape, unlike such works that emphasized the sitters and placed them in the center. This distinction explains the artist's penchant for landscape on the one hand and yet the importance of portraiture as it was his primary source of income. Further, there is something uncanny about their facial expression, which has been an issue of debate among art historians and critics. In this regard, critic John Berger opines that the grim faces of the couple was intended by the artist to make a statement about the egoistic attitude of the wealthy landowners. Some others disagree with this explanation due to the fact that the artist knew the duo personally in that Mrs. Andrew's father had helped John Gainsborough when he went bankrupt. This was reason enough for their scornful looks, particularly in the context of a class-conscious society as has been interpreted by author William Vaughn, "in her eyes, Thomas Gainsborough was the son of a charity case. The artist knew those looks this couple were giving him and recorded them with characteristic exactness." The presence of the dog that glances at them not only intensifies their condescension but also adds a pinch of sarcasm. Any extent of interpretation seems inadequate when confronted with a blank space in the painting. An unfinished area of canvas on the lady's lap where her hands rest heightens the mystery. Artwork description & Analysis: As the title suggests, the work portrays Thomas Gainsborough's daughters, five-year old Mary and her three year old sibling, Margaret. It is as if the artist anxiously wanted to capture a moment that was part of a swift movement like chasing a butterfly in which his two charming little daughters were engrossed. This is one of the earliest of the many portraits featuring his daughters that he painted throughout his career. Gainsborough observed his children with a child-like curiosity and enthusiastically wished to record their precious moments. It is perhaps, for this reason that the portrait here appears to be unfinished like a study that was part of a series of works depicting his children engaged in different activities. One very distinguishing aspect about this work is that, though it seems to be a literal depiction, it unfolds itself to possibilities of metaphorical interpretation. As a child's act of chasing a butterfly could relate to the dangers associated with the pursuit of earthly desires and resultant vanities. From this vantage point, the work stands out as a rare example of allegorical representation in the artist's entire oeuvre. It becomes evident from this painting that despite being reluctant towards portraiture, Gainsborough excelled in the genre when he painted portraits of people with whom he was emotionally attached. However, later in life when he aspired that his children too should get trained as artists, they rebelled. He expressed his dismay with the attitude of his daughters thus: "But these fine ladies and their tea drinkings, dancings, husband huntings and such will fob me out of the last ten years, and I fear miss getting husbands too." Artwork description & Analysis: This Thomas Gainsborough's portrait features the young Miss. Ann Ford, who would be future wife of the artist's friend Philip Thicknesse who was an up-and-coming musician and a well-known beauty. Here, she is shown seated in a regal posture as she gently rests her left elbow on a table and above a pile of sheet music. Her knowledge of playing several fretted string musical instruments becomes evident by the presence of a cittern that lies cradled on her lap and the viola da gamba that is shown in the background. 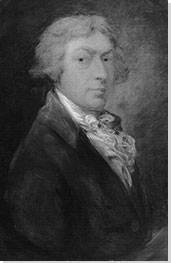 Due to his personal interest Gainsborough frequented centers of music, where in all probability he would have met Ann Ford. Significance of this work lies in the fact that it was the first full length portrait after Gainsborough moved to Bath and hence, he intended to demonstrate excellence in portraiture so as to attract further such commissioned work. Exemplary as the work is with regard to the artist's attention to minute details of fabric patterns, textures and of jewelry or accessories, it is comparable to the works of another important portrait artist from England, Anthony van Dyke. Dressed in a rich white brocade silk garment of sophisticated workmanship complimented by a black beaded choker around her neck and matching wrist bands, she exudes sensuous elegance with her legs crossed. As in so many of his works, Gainsborough makes it a point to extract the sitter's personality by not only providing details of their hobbies and profession but also via the postures and expression. In this context, Ann Ford's portrait highlights her liberal and modern outlook by representing her in a pose involving multiple body bends. What emerges from this stance is a seductive curvy contour, which is enhanced by the crossing of her legs that was considered inappropriate for women of polite society. By picturing her in this way the artist reveals her rebellious character as she had decided to go against her father's (a respectable lawyer) wish to perform in public for which he even had her arrested. Although Ann Ford was a controversial musician, her portrait contributed positively towards the artist's reputation. One notable member associated with the royal family referred to the painting as, "a most extra-ordinary figure, handsome and bold; but I should be very sorry to have any one I loved set forth in such a manner." Artwork description & Analysis: A young boy dressed in glistening blue satin stands with a left foot placed slightly forward and the left arm resting on his waist as he gazes directly at the viewer displaying majestic poise. Adding to the charm and ease of his posture is the way he loosely holds a black hat with white feathers. Titled rather literally, The Blue Boy is the first try that Gainsborough takes at presenting a full length portrait in a van Dyke-style costume, that is, knee breeches and a slashed doublet along with a laced collar. He is positioned against a landscape that applies nature based abstraction with simplified trees and stormy skies. It may be true that Gainsborough learnt from the style of master artists, but it is also equally a fact that he did not conform to conventions in creating his own compelling way of executing portraits, thereby strengthening his position as a revolutionary artist. Gainborough's modernity comes to the fore with his innovative use of color. His treatment of blue as the main color to define the subject of the painting goes against the established conventions of Western traditions where a warm color scheme was considered most effective to advance the subject of the work, while the blues and greens, often in horizontal orientation, were believed to be receding colors suitable for the background. Disproving this theory, Gainsborough successfully employs blue as the focal color with a vertical placement. Controversy around the motive behind creating this work points in the direction of a deliberate attempt at contradicting a statement made by his rival Joshua Reynolds regarding color. This is a source of debate as the statement made by Reynolds seems to have been made years after the painting was finished. Regardless of the motive, in creating a work that moves beyond the canons of a historical portrait Gainsborough transcends prior norms. He supported this when he stated, "Sir Joshua either forgets, or does not choose to see that his instruction is all adapted to form the history painter, which he must know there is no call for in this country." By rejecting the redundant notions of historical painting, Gainsborough's works created a new way of envisioning what a portrait could be and laid the foundation for future generations of modern artists. His influence can be seen in the works of Jacques-Louis David and continued to inspire other modern artists such as James Abbott McNeill Whistler who learnt from Gainsborough's technique and created a portrait of a young girl, Eleanor Leyland, in 1879 that he referred to as a "Blue Girl" (now destroyed). This work has also appeared in the modern consumer culture of mainstream society by way of being depicted on British cookie packages. Also, it was selected by the Walt Disney Company for their "Gallery of Old Masters" as one of the works, which was reproduced by replacing Donald Duck as the boy. Artwork description & Analysis: Thomas Gainsborough's Mountain Landscape with Shepherd features a shepherd tending his sheep on the banks of a pond amidst hilly as well as mountainous terrain. Moving beyond a lush array of trees would open up the background further to the soft pastel tones of blues, violets, yellows, and grays that subtly blend the mountains into the cloudy sky. This landscape painting marks a departure for the artist from his previous focus on naturalism with more exact depictions of locations. It was an intentional shift that went against the demands of artists including that of his contender, Joshua Reynolds who continued to support traditional methods of practice with relation to subject matter. The story about the making of this painting unfolds an interesting methodology applied by the artist in that he constructed a model landscape in his studio by the creative use of disparate materials like cork, sand, clay, moss and in this case, even vegetables such as broccoli. Thus, Gainsborough was able to see the simplified versions of larger natural elements in the most ordinary organic things that he found around him. He used milk to represent a pond; a broccoli floret could be a model for a tree and the like. This idea is somewhat similar to how Cézanne would revolutionize painting in the late-19th century and early-20th century - that every object in nature could be likened to a more basic, geometric form. Artwork description & Analysis: Lady Georgiana Cavendish, the fifth Duchess of Devonshire gazes out of the picture frame straight at the viewer, who is then further captivated by her tantalizing half-smile. Frills of her white silken gown match with the shiny curls of her hair that cascades down her shoulders and back, while being partially tucked under a very large black hat with a white ribbon. In one arm she holds a blooming rose and in the other a pink rose bud is held between her delicate fingers. The artist paints her face in the center of the canvas, but creates a dynamic balance by showing her in three-fourth profile. In the 'Grand manner' of portraits, of which this work is exemplary, a style Gainsborough began to develop as early as the mid-1750s and for which he was best known. Although he also painted many portraits of men in this manner, his earned the larger reputation of being a painter of "fashionable women." With his highly painterly approach to the subject he could imbue an air of aristocratic high society to all women sitters irrespective of their status or standing in life. At the time of the painting, the Duchess of Devonshire was a political activist and was in the center of controversy with regard to the Whig party campaign in 1784 when scandalous rumors of her trading votes for kisses created a flutter. Despite the defamation and ridicule in which her career was caught up, she continued undaunted with her activism to support the party that was anti-crown and promised liberty against tyranny. Her radical attitude matched with Gainsborough's liberal choice of subjects for portraits in this work. Focus on such contentious personalities as subjects for portraiture would be taken to new heights following exemplary works such as this one. Artwork description & Analysis: Thomas Gainsborough's The Morning Walk features a well-dressed, high society couple on a stroll through the countryside in the manner of a 'conversation piece'. The couple is oblivious of the viewer and engrossed among themselves holding arm in arm and looking towards something in the distance off to their right. On the bottom left of the canvas is a small white Spitz dog that looks up enthusiastically at the duo. It seems to be wagging its tail as it paces along next to Elizabeth Stephen who is wearing an ivory silk frilly dress with a suitable black hat that has a white bow and feathers. On her left walking adjacent to her is a man in a black silk velvet frock suit and white stockings. The lady and the gentleman, Mr. and Mrs. William Hallett, had recently married leading many to believe that they have been depicted in their wedding clothes. Painted during the last years of his life when he was settled in London, this work demonstrates Gainsborough's fully developed aesthetic maturity in making detailed portraits of important people. Extolling the wealth and social status of his sitters through the extravagance of their costumes was the artist's forte. This work is one such example that captures the couple at their best during a happy phase of their life (the joyful time was short lived as the man would lose all their riches in gambling). The significance of this work is also due to its illusion of movement. By synchronizing the impression of motion at different levels - the figures depicted in mid-stroll, the frills of Mrs. Hallett's dress, the curling fur of the dog, and the wavy tree branches, Gainsborough sets an example that many would follow and emulate. Artwork description & Analysis: A pastoral scene, Thomas Gainsborough's The Market Cart, depicts a family, traveling on a cart down a tree-lined diagonal path from left towards the right foreground of the canvas. A mother and child are seated on the cart, while a man, a toddler, and dog walk alongside the cart as it slowly maneuvers through the uneven alley amid towering oak trees and under the approaching umbrella of silvery clouds. The farming community and their sustenance depended on the markets. Such markets gradually became more common even before the beginning of modern society. At about the time when this work was painted it was the dawn of great movements like Agricultural Revolution that was a couple of decades ahead of the Industrial Revolution in the late-18th century. These social changes altered the concept of rural farming and eventually transformed it to become more productive and powerful. Steady alterations took shape in the farming practices that included crop rotation, new machinery, and an increase in capital investments. Steep rise in crop yields, displacement of labor force from farmlands to service oriented work and industry were a few major consequences of this changing landscape of Great Britain. On the negative side of this progress were the male workers in search of earning a living, who had to sustain themselves with activities like threshing, woodcutting, mowing, and collecting faggots. Gainsborough realized this hard work of day laborers and added a woodcutter in the shadow of the trees on the right foreground gathering faggots a year after it was painted and first exhibited. Although farmer's lives were not easy at this time, the rapid changes led to high hopes for the farming community and therefore, 'The Market Cart' is set in an idealized landscape exploring prosperity and locates itself within the paradigm of Romanticism, perhaps as a precursor to it. In this context, the work assumes significance as it lays foundation for the next generation of modern artist's like Joseph Mallord William Turner, David Wilke, and John Constable. The latter, when speaking of Gainsborough's influences said, "The stillness of noon, the depths of twilight, and the dews and pearls of morning, are all to be found on the canvases of this most benevolent and kind-hearted man. On looking at them, we find tears in our eyes, and know not what brings them." With this, the last landscape work of his life and career, Gainsborough returned to depicting the English countryside. However, on a personal note for an ailing Gainsborough, a longing and nostalgia for the rural landscape from where he began his journey as an artist may have prompted this metaphorical representation of the cart returning home at the end of the day. Artwork description & Analysis: A young cottage girl holding a dog in her left arm and a pitcher in her right is portrayed by Thomas Gainsborough here. Clad in ragged clothes, this poor girl is wandering along with her pet pal on bare feet, may be in search of food and water. A deep sense of melancholy is brought to surface when she stares with her dull, downcast eyes at a distant object outside the picture frame. Cloudy skies add to this gloomy mood and hold a sway over the trees to wave an air of desolation. Created at the end of his career, this painting is one among the variety of "fancy pictures" by the artist. But, it can even be subsumed within the category of his allegorical paintings in which he associates the girl, lost in wilderness and evokes pity, with his own daughter who had lost her senses. Gainsborough excelled in romanticized depictions of children, youth, and lovers in rural settings. These paintings are idealized representations that create a poetic view of rural innocence at a time when ill effects of urban expansions were consciously felt by many people. These works are more romanticized and narrative when compared to many other portraits he had created during his career. Artist and writer William Hazlitt recognized this when he stated that these works were not mere representations of nature as much as they were examples of "nature sitting for its portrait." Perhaps ironically, these were the works that his rival Reynolds, admired most as he was less successful in these types of paintings. He even bought one for his own collection and stated, "In his fancy pictures, when he had fixed on his object of imitation, whether it was the mean and vulgar form of a woodcutter, or a child of an interesting character, as he did not attempt to raise the one, so neither did he lose any of the natural grace and elegance of the other. "In their own day these works were highly regarded and considered progressive, innovative approaches to subject matter. Through such pioneering efforts, Gainsborough helped shape the foundation towards the development original ideas in the arts. First published on 24 Nov 2017. Updated and modified regularly.